Rick's Cafe Texan: An Unplanned History & Grammar Lesson. Thoughts on Controversy Over Use of "Polish Concentration Camps"
An Unplanned History & Grammar Lesson. Thoughts on Controversy Over Use of "Polish Concentration Camps"
It was one line, one simple line, for the review of X-Men: First Class. I didn't give that one line much though because I trusted too much in Americans being aware of history. Truth be told, many Americans are not aware of their own history, let alone world history. It was the beginning of a series of unfortunate events, to coin a phrase, and it's grown to such a proportion that I feel compelled to make special comments about them (no apologies to Keith Olbermann). The line was in reference to the character of Erik Lehnsherr/Magneto played by Michael Fassbender. For those not aware of X-Men mythology, Erik's hatred of humanity (and fear that people would come after 'the other') came from being sent to a concentration camp (I believe it was Auschwitz, though on this point I defer to my nerd friends). We saw him sent to a camp in both X-Men and X-Men: First Class. It was here that I made a dreadful, though unintended mistake. The title caption in X-Men: First Class read "Poland 1944". With that, I wrote that Erik was in a "Polish concentration camp". In retrospect, it was not only a poor choice of words but understandably inflammatory. By saying "Polish concentration camp" I meant to describe the location based on the information given to me by the film. Instead, I inadvertently muddied the waters and created for myself a needless controversy. I did not realize that the phrase "Polish concentration camp" could be interpreted as meaning that the Polish people themselves opened and operated the camp when they clearly were under occupation themselves. I somehow trusted in people being aware that the death camps were under the control and management of the Nazi regime and that the Poles themselves were victims of this tyrannical, murderous regime as were the Jews, the Gypsies, Jehovah's Witnesses, homosexuals, and anyone else who did not fit into their deranged and demonic standards. However, I simply did not realize while writing that the phrase "Polish concentration camp" could be interpreted in a way thoroughly unintended. It was a dreadful and foolish lapse of judgement. I was rightly taken to task for this error in phrasing. Hoping to make amends, I rewrote that line to read "concentration camp in Poland". This I hoped would clarify things and indicate location, which had been the original intent of that line. However, I apparently made matters worse. This was still incorrect because, like the last line, it could still be interpreted as making the Poles responsible for the actions of others. Furthermore, it suggested that Poland was an independent state when it had been split in half by the Nazi regime and the Soviet Union. I reworked it yet again, to say "concentration camp in Nazi-occupied Poland" and felt this was the end of the matter. To quote Shakespeare, "Art thou not happy?" No, says the reader, thee is still not happy. I've been asked to add "Germany" to the phrase, to read "concentration camp in Nazi Germany-occupied Poland". The thinking as far as I understand it evolves from the suspicion that by leaving the "Germany" out, I might still leave people with suspicions that there were Polish Nazis. I decided that I was obviously swimming in waters too deep for me, so I consulted the highest authority known to me. 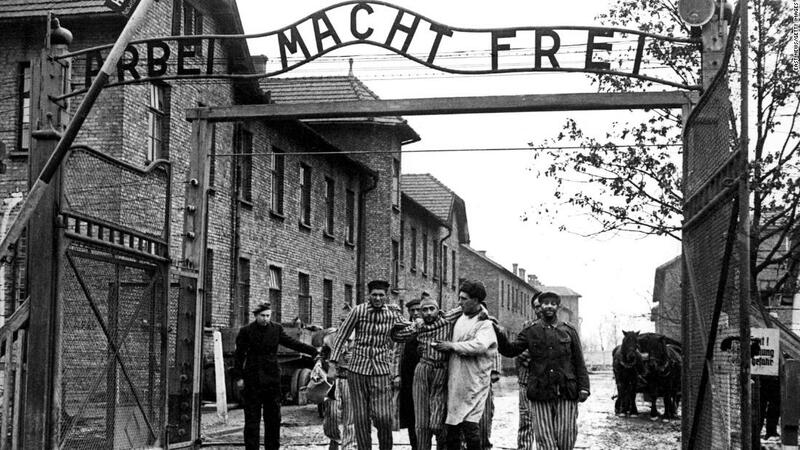 I turned to my friend Justo Fernandez II, a high school and college professor of history who is an expert in the Holocaust and the Nazi years. He is the type of person who will correct your pronunciation of the S.A. as "Es-Aaah", not "Es-say". I asked for his advice, and it was thus: when referring to occupied territory such as France or Poland, I had to add the word "Nazi" to it. Here, Justo sides with the audience and showed me I was completely wrong by referring to it as a "Polish concentration camp". I asked him if it was correct to say "in Nazi-occupied Poland" rather than "Nazi Germany occupied Poland". Professor Fernandez said, "Yes!! Correct!". Therefore, I will leave the phrase as written "concentration camp in Nazi-occupied Poland". I think this comes from a basic understanding that "Nazi" refers to Germany from Hitler's appointment as Chancellor on January 30, 1933 to the formal surrender of Germany on May 8, 1945. "Nazi" and "German" in referring to Germany immediately before and during World War II is interchangeable in the common mind. In short, when saying "Nazi", it should be understood that I'm referring to "Germany". With that in mind, and with Professor Fernandez's explanation about the correct uses of the "Nazi" and "Nazi-occupied", I will leave that line as is. Any complaints about the phrase "concentration camp in Nazi-occupied Poland", please forward to Mr. Justo Fernandez, not to me. Side note: as much as I love my friend, Justo I imagine would argue that the Republicans did invade Iraq, but I digress. ﻿In this ensuing brouhaha, my greatest fear was that my poor phrasing would somehow link me with the rantings of the man on the left (and The Left), one Mr. Stephen Fry. Now, let me state for the record that as an actor, I think Mr. Fry is extremely talented: his version of Jeeves from Jeeves & Wooster will be the definitive interpretation of the character. In regards to his thoughts & views on non-artistic enterprises, that is another matter. Stephen Fry and I are different in so many ways. He's fat, I'm...not so fat. He's an atheist, I'm born-again. He's a technophile, I'm a technophobe (this blog notwithstanding). He's an ex-con, I've never been arrested. He believes Israel is a "state founded on terrorism, massacres, and the dispossession of another people from their land" and uses the Arab description of Israel's founding (the Naqba or Nakba: the Catastrophe), I believe Israel has a right to exist and see it as a nation that has survived "terrorism, massacres, and the dispossession of another people from their land"*. In short, Mr. Fry and myself would not have much on which to build a long-lasting friendship. "Let's face it: there's been a history in Poland of right-wing Catholicism, which has been deeply disturbing for those of us who know a little history, and remember which side of the border Auschwitz is on and know the stories, and know much of the anti-Semitic, and homophobic, and nationalistic elements in countries like Poland". I want to make certain things clear. I condemn Stephen Fry's woefully ignorant and bigoted comments. I do not believe Catholicism in Poland or any other country was/is responsible for the Holocaust or all the evils of the world. I do not believe Poland, the Polish people, or any occupied nation under the Nazi regime should be blamed for the Holocaust when anyone with a rudimentary knowledge of history would know the Final Solution was a Nazi idea. 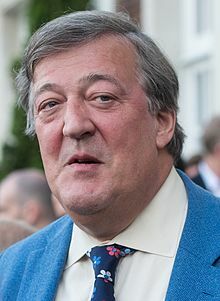 Mr. Fry hates religion in general and has a particular antagonism for Catholicism, and I believe he said what he did because he does hold Catholicism responsible for the Shoah as well as for homophobia and anti-Semitism in general. In short, Fry's "theology" is one of hate: against religion, against conservatism of any fashion, and against anyone who disagrees with him. Here's another point where he & I disagree: I don't think those who disagree with me are evil but rather that they arrived at different conclusions than I through reason and spirit, while he believes those who hold different views (such as there is a God) are at best amiable fools and at worst hold responsibility for mass murder. 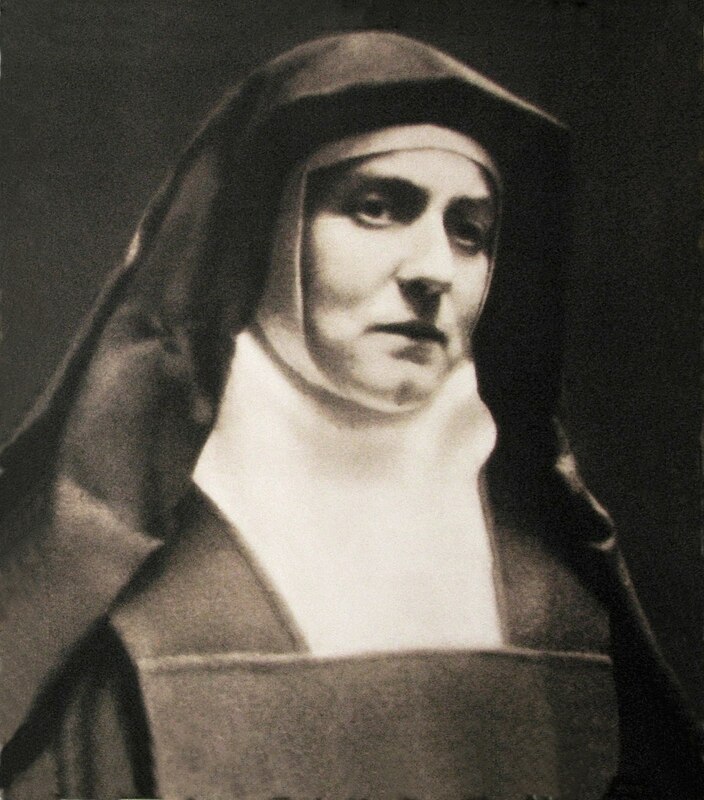 This bit of wisdom I imagine would have come as a surprise to some, such as Edith Stein, the Jewish convert to Catholicism murdered at Auschwitz who later became the first Jewish-born saint in the Catholic Church since the time of the apostles (side note: technically, it is a misnomer to refer to her as St. Edith Stein when the correct title is St. Teresa Benedicta of the Cross, but she is commonly referred to--by myself included--as St. Edith Stein), or to St. Maximilian Kolbe, the Catholic priest imprisoned at Auschwitz who volunteered to take the place of another man condemned to die. In a larger picture, even Pius XII, derided as "Hitler's Pope", allowed Jews to be hidden within the Vatican rather than be deported to the same camps Fry apparently believes the Catholic Church created. These acts, and countless others, run counter to Fry's theory that Poland and specifically Polish Catholicism were responsible for the Holocaust. I in no way wish to have my clumsy phrasing lumped or linked with Stephen Fry's woeful, foolish, and bigoted comments. To his credit, Fry apologized for his statements and will take him at his word. For myself, I too again take this opportunity to apologize to all offended by my bungled wording in the review of X-Men: First Class. I again state for the record I never intended to imply or state as fact that Poland or the Polish people were responsible for the Holocaust and regret anyone thinking I believed such things. I felt it was important to state this in a separate post because it has become an endless distraction from my comments on X-Men: First Class itself. No comments have been made about the film itself. Instead, it has all been devoted to that one damn line, and how I wish I'd never written it. With this, I hope to for once and all settle this and end what has been a frustrating point of contention with readers. I really am tired of all this controversy and frankly, my friends, no longer wish to speak of it. It was a clumsy turn of phrase, it's been corrected...twice...and I really want to move on from it. Believe me: I can see clear to understanding the vigilance Poles and Polish-Americans take when the specter of the Holocaust is raised. I as a Christian hate it when people say "Christians" bomb abortion clinics or "Christians" murdered millions from the Crusades to the Holocaust. It wasn't "Christians" but people who either claimed or used Christianity to further their own malevolent plans. However, I am just tired of all this and don't want to discuss it anymore. I'm sorry I suggested Polish culpability in the Holocaust, inadvertently as it was. I'm sorry one line has caused such consternation to people. I'm glad what I write brings out passion: I just wish it were my reviews and not a botched line within them. It looks like I finally have something in common with Stephen Fry: both of us regret ever saying what we said. Still, there's a difference: I did not mean to imply the Polish nation or Polish Catholicism were responsible for the Holocaust--he did. * My support for Israel's right to exist is firm, but I also hope that an independent state of Palestine may be founded and that Jewish Palestinians and Arab Palestinians may live side by side in peace. My deepest prayer is that one of the flowers of the Arab Spring will be a recognition that Jews and Muslims are both Children of Abraham and that a nation called Israel and a nation called Palestine will be able to co-exist free from fear and mutual hatred. Already Muslims and Coptic Christians in Egypt are seeing themselves as Egyptians first who should respect the other's belief systems and houses of worship. We should do all within our power to make the sons of Isaac and the sons of Ishmael embrace and exchange the bread of peace. I was essentially hounded to frustration over this. As much as non-Pole can understand how the term was inflammatory, I do understand. However, I've apologized for it, I've made changes to the original text that I think satisfy history, and I simply won't discuss this anymore. I've written much on this subject, and I consider the matter closed. Thanks for the explanation. Sorry for the two corrections but we did indicate from the beginning that the German Nazis were responsible for the camps. Now Imagine how sick and tired Polish people are of this phrase, and the likes of Fry who actually do state things out of ignorance and hate like "Poles were worse than Germans". I just saw a similar ignorant comment yesterday in a respected publication! Where is Professor Fernandez a college professor? I don't think he has ever had a debate on this topic and needs to be challenged. If he is a true academic he should welcome a passionate debate. Not to belabor the point (again), but Nazis is supposed to be synonymous with German, but isn't in common practice, and certainly not in circles which maliciously use it to describe Polish Christians. On this basis I am asking you to add the word German. One of the essays I'm working on is on the controversy over Song of the South. This entire episode brings the film to mind: the more I try to extract myself from this situation, the deeper and more embedded I find myself getting into it. Mr. Fernandez has tentative accepted the challenge of a debate. I have asked him to look over the two blog postings so that he can get more acquainted with them. Therefore, I would ask that he be given a week to look over the writings in question. I have been given permission to give his contact information, but again, to allow him time to prepare a response I have taken it upon myself to hold off giving that information until I hear from him. Once he tells me he is ready to make his case, I will provide his work address and you may take any points of contention up with him. Finally, on a personal level, I never found Seinfeld funny, preferring Are You Being Served? or The Kids in the Hall, but I digress. Initially I did not find Seinfeld funny either, but after constantly being exposed to it due to my wife watching the show I developed a taste for it. I now consider Seinfeld one of the funniest shows ever. Personally, I would prefer that you just add the word German to Nazi, as opposed to going through all this. I am, however, ready for the challenge. I will do this for my father, his friends, and their families, all good people who suffered for no other reason other than that they were Polish. You may also give Mr. Fernandez my e-mail. (You have it, right?) If he agrees with me, you will add the word German with no problem. Agreed? If Justo (my Nazi/Holocaust expert) holds that you are right, I will make the changes requested. If he holds that I don't, I won't. I do not think I have your e-mail, but again, I would ask that you allow him time to study my writings and see if he comes to a similar conclusion as you have or backs my side. I hope to hear from him w/i the week, and if he sides w/me, then I will give his work address and you may contact him there. Just out of curiousity, in this whole situation you've never commented on the film itself and I'm most curious if you've seen it and liked it. I didn't like it--no real story. It would please me so much as a film reviewer to get feedback. Thank you. I, with great reluctance, removed two postings which I suspect came from the same person. After reading them, I felt the tone was extremely prejudiced towards a particular group. I respect all faiths regardless of whether I hold them or not. I urge people to restrain themselves and adopt a civil tone while placing comments. I have been rather relaxed when it has come to people posting comments, but I won't allow prejudice or intolerance as part of the conversation. In short, I won't allow this blog to be used as a site to launch anonymous attacks on any group based on religion, race, gender, or any other identifying characteristic. Again, I urge people to restrain themselves and keep a civil tongue. I welcome comments, but not bigotry. I took no pleasure in removing those comments, but if this continues I will be forced to create stricter control to prevent this from happening again. Don't make things hard for everyone. Having read your thorough and detailed review, I have no intention of seeing this film. I like more depth than what appears to be in this movie, (according to your review, of course,) especially since it is supposed to be serious, as opposed to a comedy like The Pirates of the Caribbean, which I enjoyed. Paragraphs 1 and 11. Climatic should be climactic. Alas, this...reboot...prequel...whatever you want to call it, suffers from the sins of its predecessors: a lot of information that has to be rushed through in order to get to the climatic sequence at the expense of knowing who the characters are (both in terms of personality and even in name). There are also other things that made me dislike X-Men: First Class. Henry Jackson's score had a terrible habit of announcing its presence, especially in the climatic sequence when Magneto raises the submarine and the ensuing battle. Paragraph 1. Coma after “are” and before “humanity”. Paragraph 8 and last paragraph. Suppose should be supposed. We're suppose to believe that Raven (aka Mystique) is Xavier's close friend. However, she appears to have little conflict in leaving him at a critical point in his life to follow Erik (now Magneto). Fehr is a good actor (here, playing the Communications Officer), but my mind went to how much I enjoyed his work in the too-short and quickly cancelled Roswell than in what is suppose to be a major battle between the Soviets and Americans, and later between the humans and the mutants. In the final analysis, First Class needs a refresher course. I haven't heard from him since last we wrote but if I don't hear from him, based on his previous statements, I will post his contact information & let you contact him directly. FYI, I don't have your information.